"It's The End Of The World - Do You Have A Date?" 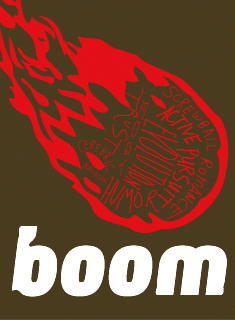 New Repertory Theatre, in residence at the Arsenal Center for the Arts, will complete its fourth season of Downstage @ New Rep with "boom" a New England Premiere by Peter Sinn Nachtrieb. Performances run February 21 - March 13 at the Center's Black Box Theater. Directed by Bridget Kathleen O’Leary, New Rep’s Artistic Associate, the cast includes Karen MacDonald, Zofia Gozynska and Scott Sweatt. As an undiscovered comet hurtles towards earth, one lone scientist takes it upon himself to preserve the human race. What happens when the woman he has taken captive refuses to procreate, and the shelter he has built is damaged beyond repair? This darkly funny New England premiere takes a look at our fascination with the end of the world and starting anew. Based in San Francisco, Peter Sinn Nachtrieb is the author of such plays as "TIC: (trenchcoat in common)," "Hunter Gatherers," "Colorado", "Meaningless," and "The Amorphous Blob." "Hunter Gatherers" received the 2007 American Theatre Critics Association/Steinberg New Play Award for Best New Play to premiere outside of New York as well as the 2007 Will Glickman Prize for Best New Play in the Bay Area. His work has been seen Off Broadway and across the country at Ars Nova, SPF, Woolly Mammoth, Cleveland Public Theatre, Brown/Trinity Rep, the Bailiwick Theatre, Wellfleet Harbor Actors Theatre, Dad’s Garage, as well as the Magic Theatre, Bay Area Playwrights Festival, Killing My Lobster, Playground Theatre, and Impact Theatre in the Bay Area. Arsenal Center for the Arts, is located at 321 Arsenal Street in Watertown. For tickets and information, call 617-923-8487 or visit www.newrep.org.